Oscar-winning designer and artist Alan Lee has something to celebrate this week after finally putting the finishing touches to the illustrations for J R R Tolkien’s The Children of Húrin, the first complete book by the author since the posthumous Silmarillion in 1977. The Children of Húrin, due for worldwide release on Tuesday 17th April, and published in the UK by HarperCollins Publishers, was begun in 1918 and was one of three "Great Tales" J.R.R. Tolkien worked on throughout his life but which remained unpublished. Now Christopher Tolkien, the author’s son, has painstakingly edited together the complete work from his father’s many drafts, and it represents the culmination of a tireless thirty-year endeavour to bring J.R.R. Tolkien’s vast body of unpublished work to a wide audience. The eight paintings, together with the dramatic front cover illustration (shown under here), and 25 pencil sketches, have been a real labour of love for the artist. He says of his work, "It is always a privilege being asked to illustrate the work of such a distinguished and well-loved author. I had already worked on illustrations for editions of The Hobbit and The Lord of The Rings for HarperCollins so was familiar with the particular challenge of interpreting the characters and places unique to Tolkien. Illustrating The Children of Húrin was quite a responsibility but I hope that I have produced artwork that will successfully complement this wonderful tale for the reader." 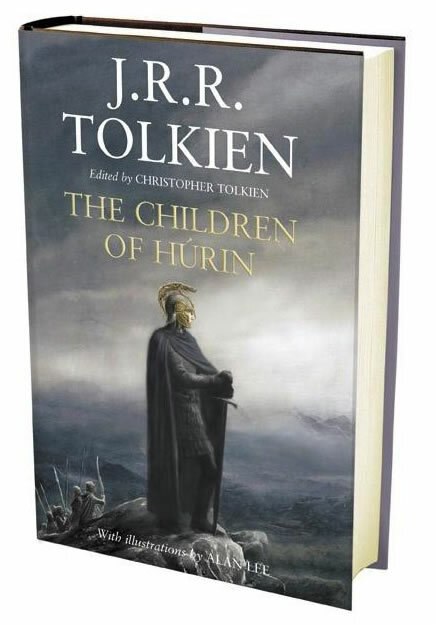 The Children of Húrin by J R R Tolkien, and edited by Christopher Tolkien, will be simultaneously published in two editions – a standard hardback edition at £18.99 (ISBN 0-00-724622-6) and a deluxe slipcased edition at £60.00 (ISBN 0-00-725223-4). Today the final cover by Alan Lee has been unveiled. "For Túrin put on again the Helm of Hador; and far and wide in Beleriand the whisper went, under wood and over stream and through the passes of the hills, saying that the Helm and Bow that had fallen in Dimbar had arisen again beyond hope. (...) And Túrin named himself anew, Gorthol, the Dread Helm, and his heart was high again. In Menegroth, and in the deep halls of Nargothrond, and even in the hidden realm of Gondolin, the fame of the deeds of the Two Captains was heard; and in Angband also they were known. Then Morgoth laughed, for now by the Dragon-helm was Húrin's son revealed to him again; and ere long Amon Rûdh was ringed with spies." 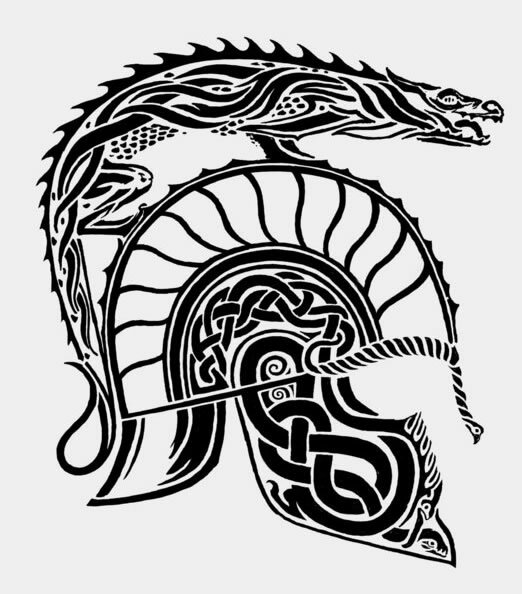 "That helm was made of grey steel adorned with gold, and on it were graven runes of victory. A power was in it that guarded any who wore it from wound or death, for the sword that hewed it was broken, and the dart that smote it sprang aside. It had a visor (after the manner of those that the Dwarves used in their forges for the shielding of their eyes), and the face of one that wore it struck fear into the hearts of all beholders, but was itself guarded from dart and fire. Upon its crest was set in defiance a gilded image of the head of Glaurung the dragon; for it had been made soon after he first issued from the gates of Morgoth." We know from my Q&A with David Brawn that this Deluxe Edition will match the current deluxe editions of LOTR (burgundy) and The Hobbit (green), and that it will be blue. For you to be able to build the complete set of Deluxe Editions, here you can still obtain some copies. These editions are limited editions and will not stay for sale for ever, so don't miss the chance to complete your set now! This deluxe cased volume contains the complete text, fully corrected and reset, and features for the very first time the pages from the Book of Mazarbul, illustrations done by Tolkien and intended for inclusion in the famous ‘Bridge of Khazad-dum’ chapter. Also appearing are previously unpublished family trees and two, full-size fold-out maps. Sympathetically packaged to reflect the classic look of the original, this brand new volume will prove irresistible to collectors and new fans alike. A slipcased edition of The Hobbit, featuring the definitive corrected and reset text, plus Tolkien’s paintings and drawings in full colour. For the first time th edition has the illustration "The Three Trolls are turned to Stone" by Tolkien, a fold-out version of Thror's Map, with the 'magic' runes only visible when the map is held up to the light and the Map of Wilderland is also in black and blue as intended by Tolkien. Not to mention the numerous other illustrations and great binding. This special one-off slipcased edition, quarterbound in quality materials and embossed to match the classic de luxe editions of The Hobbit and The Lord of the Rings, will prove irresistible to collectors and fans and as an attractive gift. While the publisher is still working out the details we can already pre-order the book at amazon.co.uk. For sure it includes an exclusive new map of the region by Christopher Tolkien (who drew the original maps for The Lord of the Rings) and jacket, colour paintings and black/white drawings by Alan Lee.